Gone are the days when trainers were solely reserved for athletic endeavours (read: the walk from the station to the office). Over the past few years, sneakers have broken free from their gym-bag bounds and have taken on new sartorial meaning. It all started when Adidas Stan Smiths became part of the It-girl uniform. Then Vans proved to be all the rage. Fast-forward a few seasons and we had the pared-back likes of Veja and Superga to obsess over. Most recently, though, "dad" trainers have been clogging up our Instagram feeds—something that looks set to continue the further into 2019 we find ourselves. Regardless of which trainer style you've pledged your allegiance to, there's one thing we can all agree on: We're so glad trainers are here to stay. 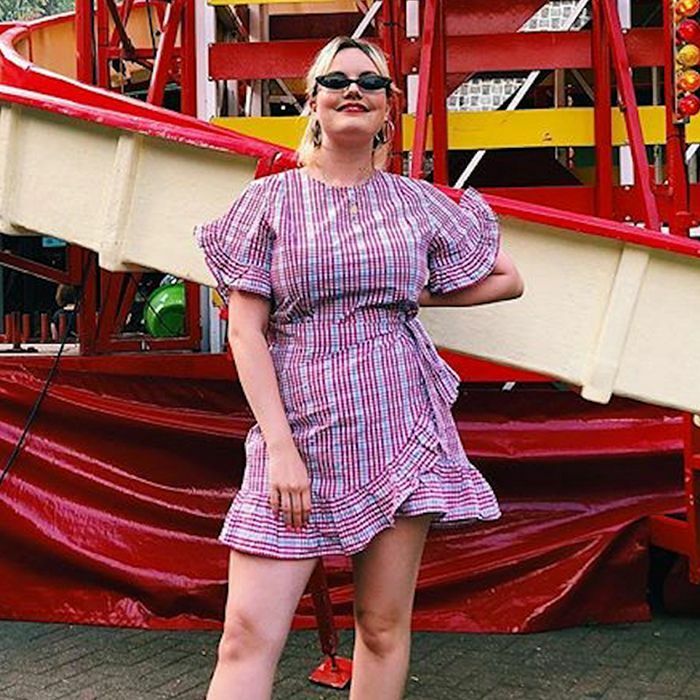 However, their styling potential goes way beyond the jeans-and-jumper combination we're guilty of sticking to, which is why we've tracked down a bounty of outfit ideas from our favourite bloggers. From dresses and cardigans to skirts and camel coats, keep scrolling to discover 27 outfits to wear with trainers that still look incredibly chic. Throw in bleach denim to complete the L.A. cool mood. Suitcase optional. Black trainers make for an excellent contrast to an all-white ensemble. Make like Megan and work three statement prints into the one look. Floor-skimming frocks always look great with white kicks. The Frugality keeps things low-key with this casual ensemble. Could Ada look more incredible? We love the effort she's put into her laces, too. Alexis gives us a master class in wearing trainers with summery skirts, while her sized-up blazer makes this look appropriate for the cooler months, too. For a chilly day, bundle up in a grey coat and roll-neck, letting your box-fresh kicks give your attire a refresh. Offset a fancy maxi coat with a pair of chunky trainers. For extra fash points, throw in some standout strides. Jeanette knows the easiest way to make an all-black outfit feel 2019 is with a pair of chunky sneaks. That checked dress (or five) you invested in last season? They'll look the part with trainers as well as boots. Trainers provide the perfect antidote to feeling overdressed. There's something very Dirty Dancing about this look, particularly when it's paired with white tennis shoes. Lucy's tiger-stripe trousers and leather biker combination are made even edgier with her choice of footwear. We're seeing mesh tops everywhere right now, so it makes sense to match them with other '90s must-haves: pinafore dresses and chunky pastel trainers. A camel coat is one of the most timeless things you'll ever own. Give it an edgy overhaul with stacked-sole sneaks and wide-leg trousers. Danielle neutralises the busy print of her two-piece with whiter-than-snow trainers. It seems checked trousers and statement kicks go hand in hand. Up the retro vibe with colourful sneaks. Of course, Topshop's slip skirt also looks good with trainers. Wide-leg strides will always look effortless when styled with a pair of Converse—the grubbier the better. Trainers and Chanel is a vibe. This look will forever be It-girl uniform. 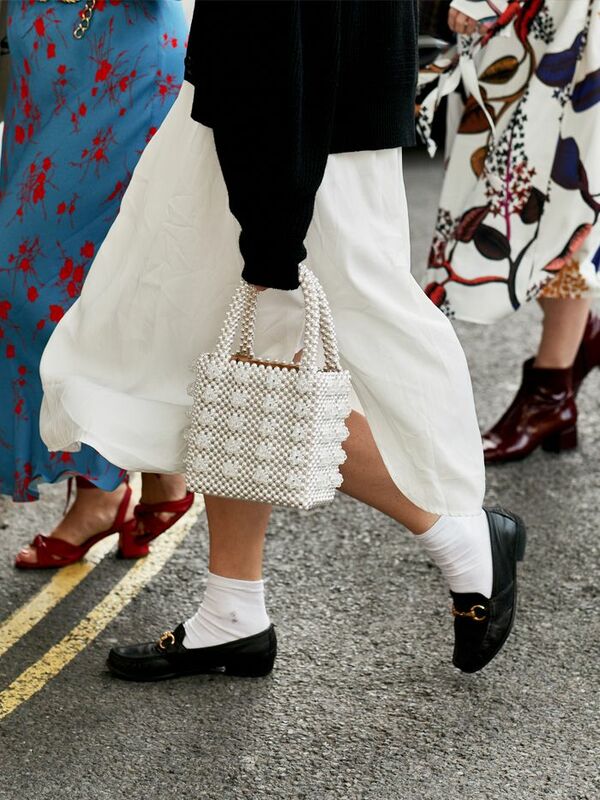 In Erica Davies we trust to give us the chicest trainer outfit imaginable. Lift the look with a bright accessory. Trainers look fantastic in this play on proportions. Ellie uses grey trainers to offset the rest of her extra ensemble, ensuring her look stays on the right side of OTT. Next: These trainers are already trending in 2019—here's how to wear them.